This is an update to the page I made for the gebirgsjager pioneer figure, because I forgot to add how I altered the equipment that I put on the figure. So now I have added here how I have altered the pieces made by DiD as follows. 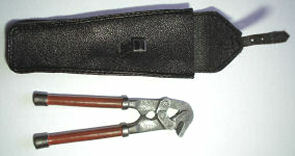 Picture 1. is of the saw and case, Picture 2. is the wire cutters and case, Picture 3. is the mine flag case all as I got them when I bought them loose. And like the other items I have altered on my other pages like the MG Case, Map Case and the Toys City Holsters. In Pictures 4. 5. & 6. I have first given the cases a light sanding with some fine sandpaper to rough up the material. Note: If you do use any sandpaper on DiD pieces like this, be careful as the material can easily tear if you press too hard. I then rubbed over it with the fine sandpaper, and on the top flap rounded edges and straps I rubbed the material from behind to thin it slightly, this allowed me to curl the flap up to make it look worn. Then onto the top of that I have painted it with some Black artists acrylic paint to dull the case. and again I have gently sanded the edges of the cases to make it look worn. With the painting I found that I had to use a slightly thicker mix of the acrylic paint and water, which I had to let dry. So that when I touched up the missed parts, the new paint had something to stick to. In Pictures 7. 8. & 9. above I have given each of the cases a drybrush of some Tamiya Sand weathering powders, which has helped to bring out the detail of each of the cases. And as shown on the right the corners of the top flap on the mine flag case curl up better now, because of the gentle sanding I did on the back of the flap. This is about how I have made some German cloth belts for my figures, as I was finding it difficult to get hold of some Afrika Korps belts. So I have converted some Toys City belts instead, by firstly making the belt itself with some 7mm wide thin cotton cloth material. I used the original belt as a guide for the correct length, I then cut two strips of the cotton material just over the belt length. Picture 9. is the back of the Toys City belt buckle with the original belt in place, Picture 10. is the buckle with the strap almost removed showing the second pin that helps to hold the belt in place. 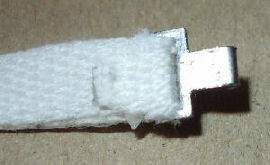 Picture 11. is the separated buckle ready for the new belt material. 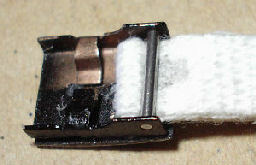 To make the new belt I carefully laid one piece of the cotton material onto some double sided tape, I then cut around the material very carefully and once in place I took the back off and put the other strip in place. I then ran the whole item between my fingers to make sure the cloth was in place, and the edges were level. Picture 16. shows one end of the belt that I have folded over and pushed in under the metal pin, I then pulled the loop through and like Picture 9. & 10. I placed the second pin in it and then I gently pulled the material tight to hold the pin in place. If needed this can be adjusted just like the original belt. Picture 17. shows the other end of the belt material that I have cut to a slight point, so that the buckle connector can be fitted. In Picture 18. I placed some double sided tape on the back of the material and folded it over to keep the connector in place. 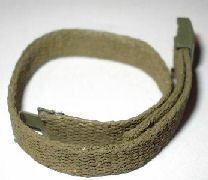 Picture 19. shows the finished, connected and unpainted cotton belt, and as a comparison in Picture 20. I have a Dragon cloth belt placed above the belt I have just made, which to me has a more detailed and in scale grain material. All I have to do now is paint the belt and the buckle a Sand colour. In the pictures above I have made two belts so that when they are painted they add a bit of variety to a uniform, picture 21. is the cotton belt after I painted the material with Tamiya XF-60 Dark Yellow paint. In picture 22. 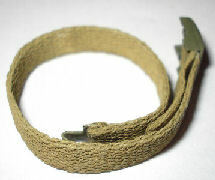 I have painted the second belt with Tamiya XF-49 Khaki for a darker colour. Picture 23. shows both belts together to show the differences in the colours. The buckles in pictures 23. were painted with Revell Aqua 362 Schillgrun acrylic paint, which when dry I rubbed a pencil over the raised detail on the buckle front. 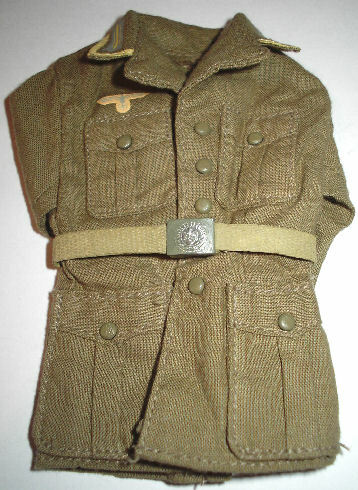 The pictures above show the belts placed around two Dragon Afrika Korps tunics, to show what they look like in place. The only thing that I have left to do with the belts is to give them a drybrush with some Tamiya Sand weathering powders. To help bring out the material grain and also slightly lighten each belt. 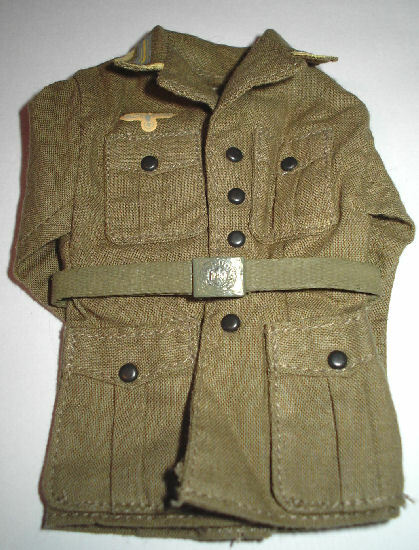 One final thing I did was to repaint the buttons with Tamiya XF-49 Khaki acrylic on one of the tunics as in Picture 24. so that it would look slightly different to the other one. 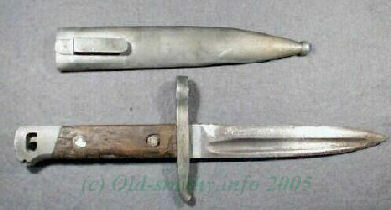 I found a picture on the internet below showing how a Kar 98 bayonet had been shortened into a fighting knife, so I got to wondering if I could do the same with a DML bayonet. 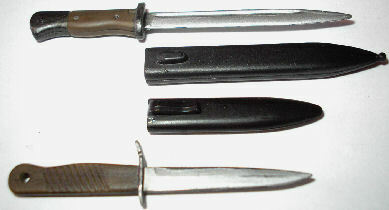 Unlike the US bayonets I have adapted before, these German knives were more of a 'Field Modification' so I feel that the blade length can be made to any sort of shorter length. The first picture below is the normal sized 1/6th bayonet and scabbard and for the length of the blade, I have based it on the conversion of the scabbard first. Which will be a combination of both of the pictures above, as I want it shorter and also to keep the moulded clip in place as well. 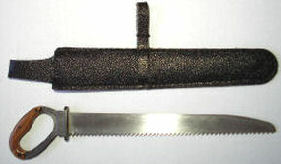 To shorten the scabbard I first cut it as shown above, and then after deciding how short I want the knife blade I then cut out a section from the scabbard in Picture 27. I then rubbed the cut ends on a piece of sandpaper to get them level, which makes it easier to glue the ends back together. As the scabbard dried I then brushed some liquid Poly Glue over the joint to strengthen it, when it had dried I then gently sanded the scabbard to get it all smooth, I then painted it with some Black acrylic paint. The blade was then laid next to the shortened scabbard as above, I made a pencil mark where I wanted the cut to be made, after I did this I then sanded the blade end to a point. To finish I repainted the blade with a mix of Gunmetal and Aluminium acrylic paint. 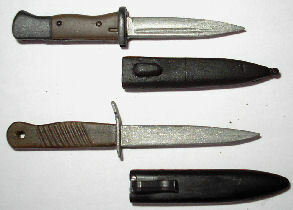 The picture on the right shows the shorter bayonet against a normal sized one. 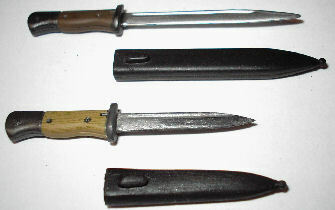 Because I have had trouble getting hold of the German DML 1/6th fighting knives for my figures, I am using one that I have as a guide for cutting down a bayonet to the same size. In Picture 28. 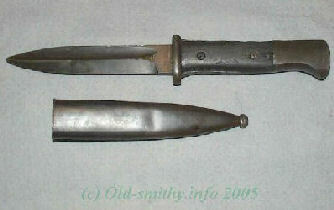 I have a fighting knife under a standard bayonet for size comparisons, and like the US knives I will adapt the bayonet the same way. Picture 29. shows another bayonet that I have cut down further, so it is almost the same blade length as the fighting knife. Many thanks to Carl at old-smithy.info for the pictures I was able to use on this page.